Last year I wrote a few essays as a reflection on the year 2010, and the experience moved me in such a way that I intend to sustain this tradition for many years to come. I strongly recommend it to anybody who wants to get more out of their years than 365 days of age; what about 365 days of memories? 365 days of learning? 365 of meaning? 2011 was a year of seeking. And this rings most true at its close, when I, by nature, collect my thoughts, reflect on my experiences, and try my hardest to make sense of my life and its meaning. Terrence Malick’s The Tree of Life was an incredible film that I watched this year, and besides bringing me closer to my childhood, it has also compelled me to seek a more illustrative, perhaps simpler definition of life. This is my tree of life. 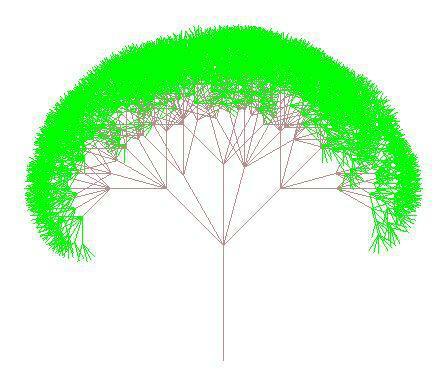 I have to admit, it is quite an ugly tree, but it is mathematical in nature because I built it out of a recursive algorithm in which every node branches out to a definitive number of new branches, or alternative paths, such that a single trunk diverges into hundreds upon thousands of individual directions. Choice is how I believe life works. You are born into this world and, given your socioeconomic and family circumstances, begin a fairly predetermined path of life: the vertical line. This is not the time or place to get into the argument on nature vs. nurture; the point is that at early development, you have not yet grasped the concept of personal choice. And so you take your first steps in life as a care-free child, guided mostly by the environment and people around you, until one day you find you have to make the first major decision in your life. Maybe you’re in the playground, and a girl your age is sitting on the metal pony, chewing on her thumb. What do you do? Walk over and hold her hand? Walk over and push her off the pony? Walk away? Maybe your parents take you to Toys ‘R’ Us for the very first time, and as your mother sets you down, you find a series of aisles before you. Do you walk down the video game aisle? The puzzle and board game aisle? The Barbie doll aisle? Or maybe you’re running in the backyard and you see that your older sister left the gate open. Do you keep running? Do you go inside the house? Do you venture out the gate for the first time? Careful–your first choice in life could be your last. Every choice you make takes you down a new path which leads to a lifetime more of unique circumstances, unique choices. There’s no turning back on this tree; where you turn is where you go. Some forks in the road lead to good, some lead to better. Some forks lead to bad, some lead to worse. Some lead, unfortunately, to an untimely end. (What if more than half of all paths are an untimely end? Does that make you feel scared or lucky?) For most, it’s really hard to say. And far enough down the line, when the leaves are green and you have seen most of what life has to offer, you might wonder how many other lives you could have led, had you taken different turns on all the forks in the road. So maybe on your death bed, if you traced your life through the tree, you’d see something like the image on the right; one unique path for every set of decisions, no two endings the same. 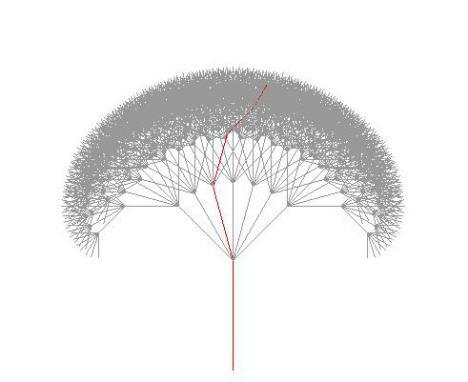 If you organize your tree as a spectrum so that the left-most paths are more liberal and the right-most paths are more conservative, or the left-most paths are more altruistic and the right-most paths are more selfish, where would your path be? Would every decision ever-so-slightly lean towards the left, so that over decades you find yourself more open-minded than you could have ever imagined? Or do you consciously take the path of greed through life? Or are you straight down the middle? Is that the fastest way to the end, perhaps? One thing you should know about me is that I am obsessed with existentialism. And as of late I have been playing with this specific theory a lot in my head. 2011 made me realize, more than any other year of my life, that the unique path I took to get from 1992 to now was not trivial. The reason I realized this in 2011 is because in 2011 I began to think about my future family, and the kids I hope to one day have. Assuming optimistically that I have a pretty successful future, and that I can raise my kids in a better environment than I was raised, how can I ensure that my kids will find the same success that I have achieved? How can I recreate the experiences of my life such that my kids develop the same value system, the same morals, the same self discipline and compassion for others? How can you ever look into your kids’ eyes and know for surethat they are of good nature? How can you know that they will not turn into delinquents, thieves, or worst of all, people without purpose? This is when I started to think about paths, and the tree, and my own forks in the road. What if you are defined not by what you do, but by what you didn’t do? In 1997, I attended a meeting with my mom at my preschool, where my teacher reviewed my grades and my writing and my artwork and concluded that I did not need to go through kindergarten, and could skip to first grade. Because I didn’t go to kindergarten, my mom put me in a Christian private school in Eagle Rock, and for the rest of my childhood I was a year younger than my peers, a year more naive. The only way I could cope was by being so confident and determined that nobody would ever notice I was younger. This is why I am mature for my age, and why I get along better with older people. In 1999, I was sent to the principal’s office for the fourth time in a month. And for the fourth time in a month, I forged my mother’s signature on my misconduct slip so that my parents would never know. When my principal brought them in one day out of suspicion of my forgery, they lied on my behalf and said they had signed so that I would not get into more trouble. This sacrifice, above any possible punishment, made me realize the errors of my mistakes. Because I didn’t do the honest thing, I found the path to righteousness. In 2000, on the last day of third grade, the girl I loved whispered into my ear the simple question, “Do you like me?” When I said yes, she whispered back, “I like you too.” That was the last day I ever saw her; my family moved to Arcadia so I could have a better education. Because I didn’t express my feelings for her day by day for three whole years until it was too late, out of fear of rejection, I lost my chance at my first meaningful relationship, and consequently I lost my ability to express my feelings to the ones I love. In 2001, I found out that one of my best friends from my private Christian school was run over by a lady who had lost control of her car while pulling into the pick-up lane in front of the school. He was stuck under the car with a fractured hip until a group of eighth graders miraculously lifted the car and rescued him, but to this day he suffers from a limp. Because I didn’t stay at Eagle Rock I might have avoided the same fate. But because I didn’t stay at Eagle Rock, I wasn’t there by his side to help him. In 2003, I made the conscious decision to find a new group of friends. For two years of middle school I had hung out with the ‘cool’ kids because of my social insecurities. In seventh grade I realized that I was losing a grasp of who I am, and that I was potentially headed down a path to gangs, drugs, and violence. I didn’t choose that path, and I found somebody who shared the same passions and morals as me to build a new friendship. To this day he is still my best friend. In 2007, I didn’t participate in Robotics Team or Government Team so that I could participate in Varsity Percussion. Percussion, as a result, taught me everything I needed know about leadership, passion, and perseverance. In 2009, I didn’t wait to see if I would get off the wait list for Harvard, Cornell, or Princeton, and submitted my Statement of Intent to Register for Stanford University. In 2010, I didn’t settle for one or the other, and I declared a double major in Civil Engineering and Architectural Design. In 2011, I didn’t see past my selfishness and insecurities, and I lost the single most important relationship of my life. In 2011, I didn’t let alcohol or drugs get in the way of my academic goals. You may wonder, though, what the significance is of choices we didn’t make. Isn’t every choice you didn’t make, conversely, a choice you did make? Yes, but that’s not the point. What is important is that, for a moment, you were staring down a path to a future you did not want. You were staring a challenge straight in the eye. And in that singular moment, when you said “NO” loud and clear in your mind, you were saying “I”. You were more yourself than you could ever be. You were living deliberately. And so a path is traced, and millions of others fade to grey. In 2011, I worked harder than I have ever worked in my life. And as a result, I did not spend nearly as much time as I should have building relationships or reflecting upon them. And so this winter break, I felt that it was important to rekindle the friendships that were meaningful to me, in hopes that they may lead to discoveries about who I am, and how I got where I am. Some relationships I have been able to rebuild, others I hope to soon, others I will never have the strength to. But most of all in this short time, I have gained sight of the vast diversity of paths that a small group of people my age has taken in just a few short years out of high school. I can’t wrap my head around the richness of the human experience. But what I can understand, more and more, is how I differ from others because of the paths I did not take. And in that difference, in that separation, I am uncovering the most about who I am. My strength lies in my moral convictions and my resistance to conformity. My life, above all, is defined by the lessons of the past. And my future will depend on the sharpening of my foresight. The tree of life is not a solution to anything; it is simply a change of perspective. Hopefully it can help you make sense of your past, as it has for me, and help you gain hold of your strongest values and ideals. Maybe it will help you be grateful of where you are in the present, in comparison to where you could possibly be had you gone down the wrong paths. And maybe it will give you bearing on what is important to you in the future, perhaps what you might want to focus on as the time for New Year’s Resolutions fast approaches. Many times in my life I have tried to uncover the meaning of life. Well, at the end of 2011, all I can say is that I have yet another possible definition. What if the meaning of life is written into the leaves of all the paths you didn’t take in the tree of life? Maybe that’s why the meaning of life is so unknowable, and always will be. My name is Raquel Chuayffet. I found out about your website because my brother Elías Chuayffet, who was your classmate at Stanford, told me about you. I am currently living in DC pursuing a masters degree in International Affairs with a concentration in development. A few months ago I faced a very hard time and my negative behaviors were becoming auto-destructive. I DIDN’T let those behaviors and thoughts control me. I said “NO loud and clear” to that version of me that was consuming my light. I was “more myself than you could ever be”. The path I didn’t take is part of my tree and I cannot be more proud of it. I find your writing fascinating and inspiring.